Report on the first wine tasting of the Bay Area Natural Wine Consortium, on Saturday, June 12th, 2010, at Terroir Natural Wine Merchant & Bar, San Francisco, California. Four wineries participated in the tasting – Broc Cellars, Dashe Cellars, Donkey and Goat, and Edmunds St. John. All of these are fairly small, urban East Bay wineries located in Berkeley, Oakland, and Alameda. Terroir bills itself as “America’s premier natural wine merchant.” The shop focuses exclusively on natural wines, which they define as using “organic and dry farming, indigenous yeast fermentation and no use of chemicals.” Their wines are almost all from Old World producers, and they also offer artisan cheese and charcuterie at their wine bar. As for the Bay Area Natural Wine Consortium? Although the group of four wineries was put together by Chris Brockway just for this event, there’s a possibility that it could turn into a real long-term organization – we’ll have to wait and see if that happens. If so, the tasting at Terroir was a very good way to kick it off. The venue at Terroir worked well for this small, informal, and relaxing event. There was plenty of opportunity to chat with the winemakers on hand, as well as to take some time to experience each wine over a longer period than is possible at a large tasting. This was my first time at a collective tasting of wines that were specifically promoted as natural, and I’m the first to admit that I’m far from an expert on natural wines. There’s no real consensus on the definition of natural wine – is it solely a matter of the winemaking, does it include what happens in the vineyard too, just what constitutes “intervention” in the process and how much of that may be acceptable? And it’s clear that many producers make wines that might well be termed natural but do not go out of their way to describe their wines that way. But tasting through the wines from the four producers represented here, a number of common themes emerged: vineyard sources are mostly (but not all) organic or biodynamic; fruit tends to be picked at lower brix; fermentation is with native / indigenous yeast, with no added nutrients, enzymes, etc. ; little or no new oak is used in aging the wines; little or no sulfur is added until just before bottling; and the wines are bottled unfined and unfiltered. Some results of this basic process that may differentiate these natural wines from more standard wines in California include: lower alcohol (below 14% in many cases); often a less obvious fruit-forward character, (a more transparent expression of the terroir? ); generally higher natural acidity (from picking fruit earlier); little or no oak flavors (from aging in older barrels, steel, or concrete); and some wines that are slightly cloudy in appearance (from not fining or filtering). But while most of the wines at this tasting shared at least some of these characteristics, it’s true that a number of other wines that are not promoted as natural can and do share the same qualities. Are natural wines more likely to have some or all of these attributes than wines made in other ways? Hard to say, though I’d guess that this is the case. But it points out the difficulty of identifying a natural wine solely on its character in the glass. Given the common themes mentioned above, there is still a good deal of variation between how these four wineries approach their winemaking (and this extends to other producers of natural wine as well) – just one example is that some add a small dose of sulfur at crush while others do not. And as with any wines, natural or not, things don’t always go according to plan, so some exceptions to the desired process may sometimes have to be made – making a yeast addition to deal with a stuck fermentation, filtering a wine, etc. But despite some differences, the goals and philosophies of these winemakers do seem to have a lot in common. Some people have claimed that natural wines are a marketing gimmick as much as anything else, and I have to say I disagree with that viewpoint. Every wine producer has to differentiate their wines from others in order to sell them. Doing that by identifying wines as being made by a process that stands apart from the norm, whether that’s called “natural” or anything else, is one way to do that. From a marketing standpoint, it’s hardly different from what any other wine producer does. Each of the four producers at this event clearly care a lot about their system of winemaking beliefs, so why not promote that? Some consumers will clearly be drawn to the “non-interventionist” philosophy that natural winemakers espouse. But for most consumers, I think the bottom line is this – does natural winemaking result in better wines? That’s obviously a matter of personal preference, and it’s not something one can judge based on a small sampling such as the one at this event. The wines at the tasting were distinctive and quite good – no question about that. This was a group of very talented winemakers – could they have made wines as good using other methods than the ones they’ve chosen? Of course that’s difficult to say. But if wines such as these are what natural winemaking has to offer, then I’d be very happy to taste more of them! Chris Brockway founded Broc Cellars in 2004, and for the past couple of years, he’s made his wine in the same small Berkeley facility where Edmunds St. John started out in the mid-‘80s. After discovering great wine during a stint working in restaurants, he got a degree in enology from Fresno State University. 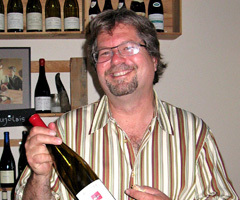 Prior to starting his own label, he worked as assistant winemaker for JC Cellars. Broc Cellars focuses mainly on Rhône varieties and blends, but Chris also works with Zinfandel, Pinot Noir, and other varieties. He seeks out fruit from sustainable, organic, or biodynamic vineyard sources, many of them in marginal, cool climate locations. While he follows the non-interventionist philosophy of winemaking, he’s open to experimenting with different methods – the results including a carbonic fermentation Carignane and a long skin-contact Roussanne. Having worked in the same facility as Chris, I can attest that he’s about as far from “high-tech” winemaking as it gets. Chris was helped at the event by Ryan Maxey (co-owner of the successful San Francisco sandwich spot, Naked Lunch), who frequently assists Chris in the cellar as well. 2008 Pinot Noir, Tondre Grapefield, Santa Lucia Highlands. From 115, 667, and 777 clones, about 80% whole-cluster fermentation. Medium-dark color, tart cherry, earth, and tea leaf with some spice notes, exceptional acidity and lively finish. Not your typical SLH Pinot – this shows what can be done with fruit that’s not as ripe as it’s usually picked from that area. 2009 “Carbonic” Carignane, Alexander Valley. From 120-year old dry-farmed vines near Cloverdale, with about 80% of the fruit undergoing carbonic maceration. Vibrant medium purple color, tangy fresh berry aromas, great acidity and delicious finish. As you might expect from a wine made this way, everything about it screams fresh fruit. Should be a great summertime wine and I’d guess serving it slightly chilled might be a good way to go. 2006 Syrah, Dry Stack Vineyard, Bennett Valley. About 30% whole-cluster fermentation and about 30% new oak – more than Broc’s other wines, but the oak doesn’t stand out at all in this Syrah. Dark color, some stemmy/spicy character along with dark berry fruit and black pepper. Fairly full-bodied but lively in the mouth, with moderate tannins. Founded in 1996 by Michael Dashe and his wife Anne, Dashe Cellars shares its winery space with JC Cellars near Jack London Square in Oakland. Best-known for a number of fine Zinfandel bottlings, Dashe also makes Riesling, Cabernet Sauvignon, Merlot, and Petite Sirah. Michael spent over eight years as assistant winemaker at Ridge Vineyards, where he learned a thing or two about Zinfandel. While all of the Dashe Cellar wines are typically made with indigenous yeast fermentations and little or no fining or filtering, a growing part of their production is going into their “Les Enfants Terribles” line of wines. These are made from fruit that is farmed organically or biodynamically and is picked earlier, uses little sulfur, and uses a different oak program from the regular Dashe wines. In particular, the “Les Enfants Terribles” Zinfandels are distinctly different from the other Dashe Zins – lighter in color and body, lower alcohol, less “Zin-like” in many respects. Michael Dashe was on hand to pour the wines at the event. 2009 Riesling, McFadden Farm, Potter Valley. From organically-grown fruit, and made entirely in stainless steel. Very pale straw color, quite floral with pear, stone fruit, and spice notes and a distinct mineral quality. Bright and refreshing on the palate, with perhaps just the slightest hint of sweetness on the finish. This has consistently been one of my favorite California Rieslings over the past few years. 2009 “Les Enfants Terribles” Grenache, Dry Creek Valley. Aged for five months in older 500-liter barrels. Light reddish-purple color, bright red fruits, with strawberry and raspberry coming to the fore, along with an earthy element. Tingly acidity combined with a silky texture in the mouth, it finished with some firm, chalky tannins that could use a little bottle age to smooth out. 2009 “Les Enfants Terribles” Zinfandel, Heart Arrow Ranch, Mendocino County. First vintage from a biodynamically-farmed vineyard near Ukiah. The wine was aged for five months in older French oak barrels. Medium-light reddish-purple color, bright and fresh boysenberry fruit along with black pepper and earth. Lively acidity and a long finish. A brambly Zin but with very fresh rather than jammy fruit. 2009 “Les Enfants Terribles” Zinfandel, McFadden Farm, Potter Valley. From 30-year old vines, this wine was aged for five months in a 900-gallon French oak cask. Medium-light color, this was less fruit-forward than the Heart Arrow bottling, with more pepper, spice, and mineral character along with a slightly earthy and darker fruit profile. A moderately rich mouthfeel and more structure on the palate than the Heart Arrow Zin. The idea for Donkey and Goat began when husband and wife team Jared and Tracey Brandt left their jobs in 2001 and traveled to France to learn winemaking from noted vintner Éric Texier. They now make their wines in a Berkeley facility not far from Broc Cellars. They specialize in Rhône-style wines and produce a Chardonnay as well. 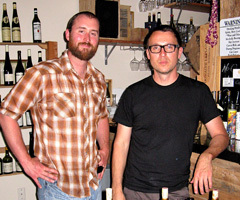 Of all the producers pouring at the Terroir event, Donkey and Goat is probably the most upfront about promoting their winemaking philosophy, and some elements of their approach – such as fermenting exclusively in wood vats – are not often seen in California, even among producers of natural wine. But they also demonstrate that use of modern winemaking equipment is not incompatible with natural wine production – Donkey and Goat use a large refrigerated container (their celebrated 24-foot long reefer!) to cool down must for cold soaks. 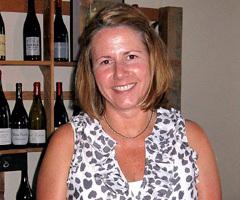 Tracey Brandt poured three of the winery’s appellation bottlings at the tasting. 2008 Roussanne, El Dorado County. Sourced from Elen Ridge Vineyard, with about 20% of the fruit spending 15 days on the skins, barrel-fermented and aged 14 months in 3+ year old French oak, with extended lees contact and batonnage. Medium-light yellow color with the slightest orange tinge, floral, minerally, and spicy pear fruit, medium-bodied with nice texture and structure. Still quite young, this could age into a very interesting wine. 2009 “Isabel’s Cuvée” Grenache Rosé, Mendocino County. From 90+ year old Grenache Gris vines at McDowell Valley Vineyard. The grapes are grown and harvested specifically for the Rosé, and fermented and aged in older French oak. Very light pink-salmon color, with restrained watermelon and earth aromas, just a hint of some floral elements, bright acidity with a very crisp, clean finish. 2008 Syrah, El Dorado County. From Fenaughty and Lightner vineyards, both in the northern part of El Dorado County. Medium purple color, this displayed spicy and herbal blackberry fruit, pepper, and a stony, mineral element. Medium-bodied on the palate, with good structure with refined tannins. Started in 1985 by Steve Edmunds and his wife Cornelia St. John, the winery has moved a few times over the years, and the production is now done at the Rock Wall facility in Alameda. 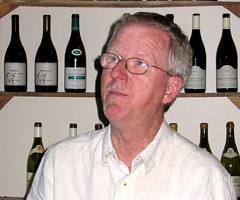 Steve had worked for a number of years in the retail wine business before starting the winery, which focuses mainly on Rhône varieties and blends, along with Gamay Noir. Long before there was any notion of a natural wine movement in California, Steve made wines in his own way, and he’s never made a big deal of that over the years – it’s just the way he does things. But he’s been a strong believer in using only older barrels so as not to mask the fruit, and he strives to make wines that are expressions of where and when the grapes were grown. He’s recently gotten a concrete tank, and has started producing wine made entirely in that tank, something that has not been seen much here in the past. You might say that in some ways, Edmunds St. John has been a trend-setter without being the least bit trendy. Steve Edmunds was at the event to pour his wines. 2004 Roussanne, Tablas Creek Vineyard, Paso Robles. Medium-light yellow color, with bright citrus, honeysuckle, and wax on the nose. This wine has always had a strong mineral component to it, and loads of structure for long-term aging. Although it’s mellowed a bit and maybe picked up a little weight and texture in the mouth from the last time I tasted it a few years ago, it’s still showing much youthful character, and it should have many years of development ahead. 2008 “Porphyry” Gamay Noir, Barsotti Ranch, El Dorado County. The vineyard source features decomposed granite soil, at around 3,000-foot elevation. The wine was aged in a stainless steel tank to avoid any oak influence, even from older barrels. This was served slightly chilled at the tasting. Medium-light purple color, with raspberry, mineral, dried herb, and an iron / rare meat component, quite complex. Lively mouthfeel, with a bright, tangy finish. California Gamay doesn’t get any better than this. 2008 "Cuvée Fairbairn" Syrah, Mendocino County. From a biodynamically-farmed vineyard near Hopland. Medium-dark purple color, displaying red and black fruits and smoky grilled meat aromas. Fairly big on the palate, with moderate tannins and some smoky notes that echoed on the long finish.